Outstanding! That swim is tough which is why pre-baiting is key. Well done! I would go with a nice protein based bollie. I've never been picky with flavors but the two that do best for me is Pineapple and Scopex. Your best bet is to fish on a Sunday because parking is free in Boston and park on Beacon St. The walk depending on where you fish could be a couple blocks of walking to a swim. If your going to fish over by the esplanade pull off the exit on the left before the esplanade off storrow drive. You may want to get down there between 6-7 AM to get a parking spot but that is the closest parking to that area. I should be able to attend. I may bring the family too.. I do work alot of weekends so as long as they don't put more OT on me I can attend. Hi Josh, Welcome to the forum. Glad to see more Western MA guys on the site. It looks like the CT River has been very nice to quite a few people. As for a State Record its all about the ethics these days. Alot of people are upset at how the State's view is on carp. I myself got a first hand verbal by one of the wildlife workers recently and their stance is very distant from where we are. They actually talked about bow fishing for them and how fun it is so you just have to keep enouraging these folks because the state of CT has a perfect catch and release system that would help preserve trophy size fish instead of killing them for a record or a gold pin. Anyway, enjoy the site, enjoy fishing, and have fun. Just dont feed into the negativity of those specific anglers you may meet along the way that think they know everything and everything is a secret. There are 4 goals in this club and being a douche isnt one of them, Lol. Best of luck and post some pics..
Had a nice time catching up, great to see you guys. I dont believe they had the ice fishing records for catch and release back then otherwise Scott may have gotten the record. I just found out he also works at the company I sub at, LOL!!!!!!! I was able to track him down through the company address book and we were cracking up about how I found him. He only had a min to chat but would touch base later, he said he was jigging for pike. Hi Harry, You have some decent fishing right in Waltham along the Charles. The Moody St Bridge has some good areas that you can fish. Fish there or any place on the Charles typically range from singles to high teens with 20's here and there along with some pretty mirrors. 30's are possible and rare on the Charles, your best luck for a 30 would be in the Watertown area during spring. One 30 that I know of did come out of there in 2011. FF, I'm from the North Shore and had some experience on the SE side with my brother who's carp fished over 30+ years in MA and lived in Pembroke for many years. Here is what i can tell you without giving out carp spots completely: There are a couple ponds south of Boston in Quincy ,Dedham,Hyde Park areas as well that house 20-35lb carp, I lost my first would of been 30+ in this area last year. Taunton River is a decent start for smaller carp in the area of Taunton, if you head further down river the fish get thicker, bank access is limited though, most areas boat is preferred where there is lots of private property or no shore access, try fishing closer to the Dighton area if you have access by boat.. 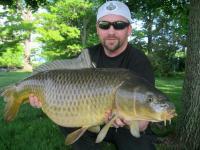 There are also some nice carpy areas in Plainville, Foxborough, and Abington. The main issue is that the Mass Fisheries Website does not list carp in many SE ponds because they only list what is stocked or reported by anglers so in this case mostly bass, trout, and salmon ponds. 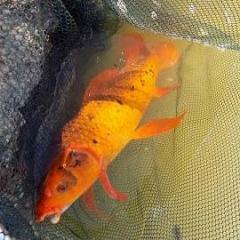 There are MANY untapped carp waters in SE MA so go get em and best of luck!